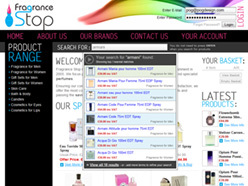 Items are instantly added to the basket, without constantly moving the user away from the product page. The basket is saved so even if the user turns off their computer, when they come back all their product choices are still there. Admins can even view these baskets. eZecom is built from the ground up to redevelop and revitalise features which have become common place and under utilised. Upgraded areas include unrivalled search function (FindFast), an persistent shopping cart solution (QuickCart) and social networking ideas. And that’s just the front end features. Our suite of applications for marketing, merchandising, and analysis for the site admin is even more impressive. FindFast is a new and exciting way for your customers to find your products. Instant in-page notification of search results helps your customer to quickly narrow down their terms without having to wait for page reloads. QuickCart allows your customer to buy items from the same page without having to move to the basket every time, which can break their concentration, and lose potential sales. The QuickCart is also persistent, allowing the customer to close down their browser and return to your store upto 28 days later, and not have to spend time remaking the order. Time specific special offers are easy to set up and work by themselves. Set a whole months worth of special offers within minutes, and the site removes the offer at the alloted time. You don't have to keep a track of whats showing when. 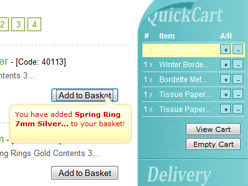 Coupons easily allow you to offer instant money off orders, to generate orders. Multi-use coupons are standard, with single-user single use (a.k.a. gift certificates) and multi-user single use coupons being available also. Refund back to the customers account, and they are automatically promted to use their store credit notes on future orders. This ties the customer to your company, meaning that they don't spend their refunded money with a competitor. Built-in up to date rules for Search Engine Optimisation across the entirety of your site. These systems form the core of eZecom and are included in the price. The front end of eZecom is much more substantial than this, but to list *all* the features would take a long time. Please speak with us regarding all features, including auto-checking of input forms to reduce fraud, invoice PDFs, sorting products in other ways and even changing the layout of the product pages. The account is made during the checkout process, is transparent and requires no more pages than not making an account. An account is not needed to browse the site and add products to the basket, but is for proceeding though checkouts, adding multiple delivery addresses and making wishlists. 1) eZecom automatically generates product descriptions for linking through to the major social networking sites, letting your customers spread the word about your company. 2) User defined product tags builds extra search pages on your site, and make the user feel more involved leading to greater connection with your company and products. eZecom lets you do as much or as little on-site search engine optimisation as you want to. You can add your own meta descriptions and keywords to products, categories, news/blog posts or, if you didn’t understand the first half of this sentence, let the system take care of it. We’ve designed the information that eZecom gives the search engines to be relevant, precise and unique. In fact we update the on-site SEO techniques so often that your site stays fresh without you doing a thing. We can also advise you on best practices for adding search engine optimised content, so that your pages and products achieve the highest position possible. Don’t just take our word for it though. As with everything with eZecom, we can produce results to back up our claims. You can see from the links provided below that we don’t add extra parameters to the search results, which other companies do to make their results look better to potential clients. These results are purely a random sample of keywords that Castlehill Crafts asked us to focus on during our SEO campaign for them. We are particularly proud of “schools supplies”, appearing on the 1st page out of over 194 MILLION results. If you want your site to rank in Google and other search engines, look no further than eZecom. The Admin system, which we've dubbed the "PDA", is delivered in crystal clear English, so you always know where you are. Not that it's easy to get lost. We've kept the number of pages to an minimum. To add a single product we've seen systems that need upto FOURTEEN mouse clicks through the different pages. eZecom can be done in TWO! The most frequent area of the site you use will be adding and updating products. eZecom gives full control over products, with the ability to add multiple images per product, custom specifications per product, custom search information (alternate names etc) and edit product comments and user tags. Upgrades include multi-tier pricing (which also can be set at a customer level) and multiple purchaseable options per product. No other system gives so much control over products! We’ve also made it amazingly simple to sort the products in the order you want. A simple drag and drop feature quickly sorts both products and categories, meaning you don’t have to worry about which order you add the items to the system. Products can be able to multiple categories and then only need to be edited once to change all instances of that product throughout the site. If you have products that are similar, they can be “cloned” and then the relevant parts changed to make a new product. Whole categories can be made in minutes! As visitors move around your site, and add items to their basket, you can now see their baskets being made in real time. This gives a clearer picture of how your visitors are using your site, and what products interest them most. The PDA is even easier to use than the front of the site! The PDA lets you control every facet of your site, quickly and easily. Add or update products, view orders and related statistics, make user groups for focused email marketing, make news/blog posts, track current site visitor baskets or just see how much money you have made! The Dashboard Area gives a day by day account of many orders you’ve taken and how much you’ve made. This information is displayed in an easy to read graph, giving averages per day and estimates for the month. You can also quickly see how many orders you’ve taken, the details of the last five orders, which products are out of stock, and which are most interesting to your visitors. The customer account page allows you to view all your customers information, group them into marketable segments, enable or disable their account or email settings and see how many orders they’ve made. You can search for specific customers or groups of customers quickly and/or update their accounts. The Order Detail page shows you greater information about an order, allowing you see the customers billing and shipping addresses, how much the order is, if the customer has ordered before, what items are on the order and if the order cleared the payment process. You can also easily send the customer emails from this page, if you need to inform them of out of stock products or delivery tracking numbers. These emails are saved to the database so that you have a history of your interactions with the customer. "[PoGDesign] ...have been always helpful, with a friendly approach and a great understanding of our needs and wants. Now in our 2nd year of trading, the website has even more new features and is enjoying a healthy increase in traffic. As a business we always wish to remain competitive and as such regularly evaluate our suppliers. PoGDesign continue to outperform the pack." "After being let down by another company we approached PoGDesign after finding them in Google. They showed us the unique features of eZecom and how easy it was to use. We were so happy with the system that we signed on with them just hours after that first meeting. Since then they have been no more than an email or phone call away, always giving us excellent service and advice." "What we like most about PoGDesign, apart from their obvious skill in fantastic design, and their speed of turnaround whenever we need additional work doing, is their intelligence and problem solving ability. The scale of the new site seems to grow weekly, yet every time, Dennis and his team are there, one step ahead, giving us new and better solutions than we thought possible. Our new site is set to be such a massive leap forward over our old one, and we couldn’t have done it without PoGDesign and eZecom."